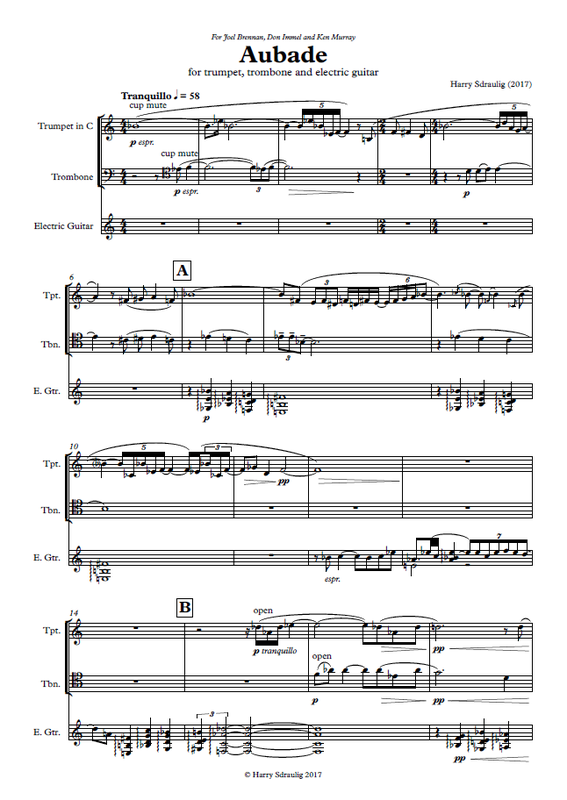 This little piece was written for fine musicians Joel Brennan, Tomomi Kondo and Anthony Halliday, who premiered the work in January 2018. It should be played with a gentle, flowing character to bring out the introspective lyricism of the music. Aubade was commissioned by Joel Brennan, Don Immel and Ken Murray of Ensemble Three. The title carries no specific programmatic significance. Nevertheless, the introspective and lyrical mood sustained throughout much of the piece may be likened to the gentle radiance of a crisp, autumnal morning. Expressive and interweaving melodic lines are underpinned by subtle twists in chromatic harmony. It was my desire to make this unusual instrumental combination sound as natural and inevitable as possible. Indeed, I have tried to explore a range of colouristic and textural possibilities that this intriguing combination offers. Joybox was commissioned for Musica Viva Australia under the auspices of the Ken Tribe Fund for Australian Composers. Predominantly, it is an energetic and fast-paced exploration of a single thematic idea which is subject to a multitude of transformations and interruptions. The title is derived from the word 'jukebox', and the rapid changes in mood and style may be likened to a jukebox quickly cycling through different musical tracks. Prisms was commissioned by Macedon Music, based in the Macedon Ranges, for the Syzygy Ensemble. Prisms received the 2016 Glen Johnston Composition Award at its premiere performance. The work is in two parts, separated by a break. Each part is itself divided into two highly distinct sections, making for a total of four movements: Introduction, Dance, Nocturne and Toccata. As an object, a prism will separate a beam of light into its constituent spectrum of colours, in turn drastically transforming the visual appearance of the original beam and creating a spectacular display of colour. In this piece, I have specifically made the concept of musical colour the main focus. The ways in which the work’s musical objects (for example – melodies, chords or textures) are developed may be considered analogous to the behaviour of a prism. Motives or harmonic colours are often transformed or dissected in combination with other more foreign elements in the music. The Introduction is played by piccolo and violin only. Here, the piccolo insists on a gentle, modal melody while the violin circles around it, altering the melody’s harmonic context and therefore presenting it in different shades of light. The Dance is lively and busy but rarely rises above pianissimo, with its energy bubbling frantically below the surface. The Nocturne is more reflective and lyrical in mood, beginning with a tender violin solo accompanied by gentle ripplings in the piano. After slowly building to a rather intense climax, the music returns to a gentler, mysterious atmosphere before leading into the Toccata, an energetic finale which demands considerable virtuosity and ensemble cohesion between the performers. The title of this work has no specific programmatic significance. Nevertheless, I have attempted to evoke in musical terms a dreamlike sense of mystery and drama. The two Incantations, characterised by stark and declamatory insistence, may be considered musically analogous to the casting of spells. The Dance is lively and energetic, though often bubbling with the music rarely attaining any great volume. Sections of extended polyphony contrast with ever-changing rugged rhythmic elements and the overall movement places considerable demands on the virtuosity of the performers. The Lullaby is unwaveringly gentle and, in many ways, a self-contained response to the often frantic or unsettled nature of the earlier movements. At times, the stillness and veiled dissonance in the piano recall harmonic textures of Messiaen, though deployed within a different context and harmonic language. The final pages eventually fade into tranquil silence, albeit with a sense that not all is resolved.